The dreamers who think they’ll soon be running entirely on sunshine and breezes, have just been smacked with reality, in Victoria, at least. There’s something poetic about watching infants being forced to grow up. And, so it is, with once loyal RE zealots, being forced to rethink their love affair, after their taste of what it’s like swelter in Melbourne, without the benefit of that first world necessity, electricity. Over the last couple of posts, STT has focused on the chaos that reigned in South Australia and Victoria on a couple of hot days – coupled with wind power output collapses (see above) that resulted in hundreds of thousands being deprived of power, 200,000 in Victoria, alone – and the price of power going through the roof. Watching the panic spread was, somewhat, amusing. Nothing like watching those who thought they understood the electricity system left floundering and struggling for words. STT has been warning Victorians for years that they’ll soon experience the mass blackouts and routine load shedding that’s part and parcel of South Australian life, if they continue to follow the same route. Well, they have, and they did. What follows below is a running commentary from The Australian as the debacle evolved. STT won’t bother dealing with the propaganda and other nonsense pitched up by those trying to defend the indefensible. We’ll leave that to our loyal followers. The Australian Energy Market Operator ordered load shedding to commence in Victoria today, as extreme heat put pressure on the state’s electricity network. The last-resort move was aimed at freeing up 200 megawatts of power, subjecting 100,000 Victorians to rolling power outages. AEMO confirmed the scheduled supply disruptions or “rotating brownouts” began at midday. Meanwhile, bushfires are devastating large parts of Tasmania have forced evacuations, and there are emergency warnings in Victoria. Melbourne is expecting milder temperatures across the weekend, with a forecast maximum of 25C, while northwest parts of Victoria also in line for some reprieve. Airconditioners and fans offered no relief for more than 200,000 Victorian energy customers who had their power cut and were left to swelter through extreme temperatures on Friday. The heat peaked at 42.8C in Melbourne, with planned power cuts known as “brownouts” imposed by the Australian Energy Market Operator. The cuts lasted for up to two hours in some areas but were deemed necessary because two generators at Yallournand one at Loy Yang failed to cope with the extreme heat. By midafternoon, the temperature had dropped by 15C in 30 minutes and the AEMO confirmed the cuts had ended. Power cuts to more than 200,000 Victorian households this afternoon have concluded with the electricity grid now operating with sufficient reserves. The interruptions and emergency resources gathered from standby generators were needed to protect the power system during record-breaking temperatures, high demand and reduced generation availability. More than 250 megawatts was required to be cut during the peak demand period, equating to between 60,000 and 100,000 consumers without power. The Australian Energy Market Operator issued a direction for networks to begin the restoration of all lost load at 3pm local time. AEMO said it does not envisage any further power supply interruptions this evening, over the weekend or into next week, with sufficient reserves forecast across the National Electricity Market. “AEMO acknowledges the inconvenience and hardship of losing power supply during extreme conditions, and thanks all Victorians for their patience. AEMO would also like to recognise the contribution made by Victorian consumers and businesses who have purposefully conserved their energy use over the past 48 hours,” AEMO said in a statement. Federal energy minister Angus Taylor said the government was closely monitoring the energy situation in Victoria and understood the frustration of many families and businesses. “Action taken by the Australian Energy Market Operator has been targeted to maintain electricity supply and support the grid as Victoria deals with extreme weather conditions, high demand and reduced supply,” Mr Taylor said. “The Australian government thanks AEMO for the job it has done managing a difficult situation in collaboration with the wider energy industry. “The conditions experienced over the last two weeks across the national electricity market reinforce the need for investment in reliable 24/7 generation and the retailer reliability obligation. “That is why the government is backing in new reliable generation investment through its Underwriting New Generation Investments program which has had strong responses to its registration of interest process that closed on 23 January. Labor leader Bill Shorten said he was very concerned about the load shedding, suggesting the Morrison government was partly to blame. “Ever since the federal government said they could lower power prices and took responsibility for the power debate, it’s now partly on the federal government’s head this challenge of blackouts,” Mr Shorten said. “They’re the ones who said that renewables were a waste of time – well they’ve been in charge now for the best part of six years. Mr Shorten said the last six years of energy policy had been a disgrace. “While this government has been debating the scientists and the community about renewable energy there has been a virtual freeze on investment in power generation and now sadly when we need our power the chickens have come home to roost,” he said. “While you have a government that can’t deliver a coherent national power policy, there will not be investment in new generation and where you don’t have investment in new generation, sooner or later the old generation will fall over and then we face these sorts of crises.
.@LilyDAmbrosioMP on Victoria's blackouts: Any loss of power, however brief, is a worry. People should be rightly disappointed that the power grid was not up to the task today. Ms D’Ambrosio described Richard Di Natale as a “dilettante” who “waltzes in and out when it suits him to grab a political line” after the federal Greens leader blamed an over-reliance on coal for the Tasmanian bushfires. “The fact is, Victorians were in the middle of one of the most extraordinary heatwave events that we’ve seen in many, many years,” she said. The energy minister said there was typically no compensation for customers inconvenienced by load shedding. “What I would do is encourage those members of the community who feel that they’ve not been able to tolerate being off for an hour – and most people, if they were off, they were off for no more than an hour, although in some areas it was up to two hours – that they make contact with relevant authorities,” Ms D’Ambrosio said. Asked about the Victorian opposition’s description of today’s power outages as “Third World”, Ms D’Ambrosio said voters had spoken loudly and clearly on the Coalition’s credibility on energy policy at the November election. “They had no energy policy. The only energy policy they took to the last state election was to build a new coal-fired power station which – even if you started building it today – would take eight years to come,” Ms D’Ambrosio said. “No-one is prepared to finance it, and we can see that the problems we’ve got now is that we’ve got a 20th Century system for a 21st Century climate, and the fact is our thermal generators are ageing, they are becoming less and less reliable. Ms D’Ambrosio talked up the Andrews government’s renewable energy target. “More energy supply is available to us in Victoria this summer than it was this time last year. That’s because of our strong emphasis on renewable energy: the quickest form of energy to be built, the cheapest and, of course, if we have a look at today, the most reliable. “Wind power came through today. Wind power produced sufficient power generation – as was anticipated. AEMO data showed the batteries generating just 25 megawatts of a Victorian total of 8,622 megawatts at 7pm last night. Victorian energy minister Lily D’Ambrosio said extreme heat had caused demand for power to increase to unanticipated levels. “It meant a reduction in power output from the existing thermal generators that are still in our system,” Ms D’Ambrosio said. “That came on top of the fact that we’d lost three units of power generation from our coal generators in the Latrobe Valley overnight and into this morning. Ms D’Ambrosio said the gap between supply and demand had been 250 megawatts, in a context where Victoria was 1,800 megawatts down in terms of normal power generation capacity. “That is an extraordinary figure to lose power in Victoria, 1,800 megawatts, and essentially, most of that was as a result of failed infrastructure from our coal and gas units – in particular, coal and, of course, a decrease in the output of power from those generators that were able to remain in our system,” she said. Ms D’Ambrosio said the load shedding had been necessary to make up the 250 megawatt shortfall. “The market operator, some time ago – a short time ago – directed the distribution network businesses to commence restoring that power, that 250 megawatts,” she said. “We are at the point now where most Victorians are now back on full supply. Ms D’Ambrosio said there had been around 150,000 Victorians who had lost power supply at particular points in time. The Australian understands the outages peaked at 161,848 customers. “I do want to thank all Victorians for their patience and understanding throughout this time. It has been an extraordinary heat event over the last few days,” Ms D’Ambrosio said. “People should be rightly disappointed that the power grid was not up to the task today, but certainly there will be time for us to reflect on the occurrences of today.
.@LilyDAmbrosioMP: We lost, in terms of power generation, 1,800 megawatts of power capacity in Victoria. Most of that was as a result of failed infrastructure from our coal and gas units. More than 160,000 Victorian households and businesses were left without power at the height of the load shedding. At 2:30pm, 161,848 consumers were without power. This included 85,750 Powercor consumers, 23,468 from Ausnet, 32,093 from United Energy, and 20,537 from Jemena. The majority of those customers have since had their power switched back on. At 4pm, 1615 Citipower customers and 9954 Powercor customers remained without power. Poor government policy and its distorting impact on investment is as much to blame for the country’s fragile power grid as heatwaves or technical issues, the Energy Policy Institute of Australia says. “Power failures surely follow policy failures. The Australian federal and state governments are collectively to blame for the present failings of the power system,” the institute’s executive director Robert Pritchard said. “The present power cuts are not really caused by heatwaves or technical issues — they can be traced back to over a decade of policy failures that have distorted investment patterns. And there will be more power cuts coming for as long as the policy failures remain unaddressed,” Mr Pritchard said. The cool change which brought blessed relief to parts of Victoria saw temperatures in Melbourne drop 12C in just seven minutes — a stark contrast to the city’s top of 42C earlier. Now thunderstorms are developing on the back of the gusty change. Melbourne CBD reached 42.3C at 2pm, but had rapidly dropped to 30.8C by 2.09pm. Trains and trams were being speed limited across the city to allow for potential track warping in extreme heat. More than 70 sets of traffic lights were out as the power cuts kicked in. With the change bringing the risk of rain, thunderstorms and dusty erratic winds and there is also a risk of dry lightning, which could spark more fires. Victorian opposition leader Michael O’Brien said the load shedding today in Victoria has shown the failure of the Andrews government’s energy policies. “Something is seriously wrong when the power goes out in Victoria because we don’t have enough supply,” the Liberal leader said. “On a day of extreme temperatures, there are serious health and safety concerns with deliberately cutting off supply. “When Labor policy led to the closure of Hazelwood Power Station, the Liberals and Nationals warned that Victoria was left exposed. “We are not a Third World country. We deserve a safe and reliable power grid. “In the midst of the heatwave in Victoria, only around 6 per cent of total energy generation was being provided by wind energy generators despite the provisions of billions of dollars in subsidies,” Mr Wild said. We’re now up to almost 100,000 outages, with 28412 Citipower customers and 69834 Powercor customers switched off. According to CitiPower and Powercor, 73,725 households and businesses are currently subject to outages across Victoria. This includes 28,047 CitiPower customers and 45,678 Powercor customers. Victorian opposition acting energy spokesman David Southwick said it defied belief that in a first-world country like Australia, Victoria has a state government that can’t guarantee enough electricity for people to go about their daily lives. “Melbourne is currently hosting thousands of international tourists for the Australian Open who must be wondering why the state government is asking its citizens to refrain from using common household appliances to prevent large scale blackouts,” Mr Southwick said. “Most Victorians agree that renewable energy is the future but we need to make it a sensible transition that doesn’t threaten power supplies and cost Victorians a fortune. Meanwhile Victorian Energy Minister Lily D’Ambrosio talked up the Andrews government’s investment in renewable energy. “I think what’s important is that you’ve got a government here in Victoria that’s got a plan about transitioning out to a new energy system so that Victorians can remain confident that they will continue to have reliable power when they need it, and that means of course as a government we have very ambitious renewable energy targets,” she said. “Right now we’ve got more than 4000 megawatts of new renewable energy projects that have either been built or are being built — 4000 megawatts is a significant amount of additional power when you consider that the demand today of Victorians is around 9,600. Greens leader Richard Di Natale has blamed an over-reliance on coal and energy policy failures for the Tasmanian bushfires and the increased risk of bushfires near his family home. Richard Di Natale says those complaining about power outages should think about the “sacrifices made during war time” if they complained about not being able to use home appliances. AEMO CEO Audrey Zibelman said the Alcoa smelter at Portland was also due to go offline at 2pm, freeing up approximately 270 megawatts initially, with a further 100 megawatts subsequently. “As I said yesterday, the first thing we do is go into the reserves. Once we exhaust the reserves, we really have to go into load shed to protect the system,” Ms Zibelman said. 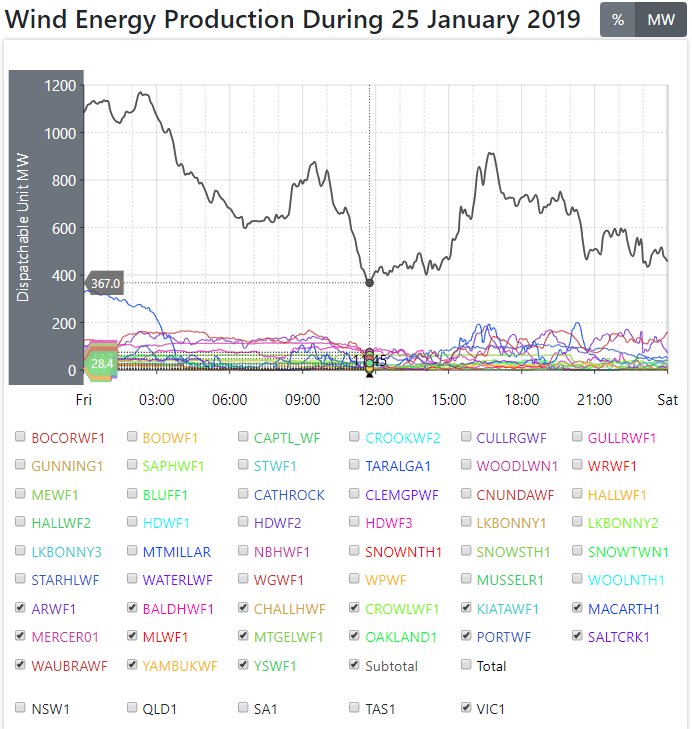 Asked whether Victoria was getting power from South Australia’s diesel generators, as occurred yesterday, Ms Zibelman said the South Australian generators were not being used today because of better wind power generation conditions in that state today. Victoria no longer has back-up diesel generation after it was deemed unnecessary. Ms Zibelman said South Australia’s diesel generators had powered both states yesterday. “It was for both of them. We’re looking at reserve needs, so we share the reserves across the regions,” she said. “Today, South Australia does not need reserves, and so what they’re doing is they have excess generation, and we’re able to take advantage of that in Victoria. AEMO CEO Audrey Zibelman said she could not put a figure on the cost of paying manufacturers such as Alcoa to switch off their power in times of high demand. Last year, it was reported that the practice had cost taxpayers $50 million. “We’ll have to figure that out after the point, but the difference between last year and this year is, last year, when we did this program, we actually paid what was known as just a pre-activation amount, so we actually paid dollars just to make, generate resources available,” Ms Zibelman said. She said approximately 10 companies had gone offline voluntarily yesterday to increase energy reserves, including Alcoa. Ms Zibelman said load shedding was common practice around the world. “All countries that I’m aware of, and again, I have been in the business for 30 years, and over periods of time you run into these systems like you have, where you have generators that go off and you have to do load shedding,” she said. “This initiative follows the activation of all available resources procured under the Reliability and Emergency Reserve Trader mechanism in Victoria,” the market operator said. A long list of suburbs and localities across the state are affected, including parts of: Epping, Mill Park, Lysterfield, Rowville, Clyde, Cranbourne East; Southbank, Armadale, Toorak, Camberwell, Fairfield, Northcote, Caulfield, Elwood, Beaumaris, Bulleen, Burwood, Riversdale, Bentleigh, Heathdale, Balaclava, Malvern, Balwyn, Surrey Hills, Essendon, Essendon North, Strathmore, Glenroy, Oak Park, Kalkallo, Broadmeadows, West Footscray, Fairfield, Ivanhoe, Alphington, Airport West, East Keilor, Niddrie, Ascot Vale, and Moonee Pond, Camperdown, Weerite, Yarrawonga, Bundalong, Castlemaine Muckleford, Lara, Corio, Norlane, Herne Hill, Hamlyn Heights, Balmoral, Haven, Woolsthorpe, Grassmere and Mailers Flat. AEMO said it was expecting more favourable weather and supply-demand conditions midafternoon, with a cool change expected to hit Melbourne about 2.30pm, after which they do not expect to schedule further disruptions. Earlier today, Victorians were urged to cut power use ahead of another day of record-breaking heat. Adding to the tight supply situation was the loss of a second unit from EnergyAustralia’s Yallourn coal-fired power station overnight due to a tube leak. Major generators including AGL’s Loy Yang A and Liddell plants are were running at less than full capacity due to faults, ratcheting up pressure on the nation’s fragile electricity system. Some 40,000 homes lost power in Victoria and South Australia overnight due to the severe heat forcing street-level transmission infrastructure to shut down. EnergyAustralia said it was forced to take the Yallourn unit in Victoria’s Latrobe Valley offline today despite the desperate need for power supplies. “We took the decision to continue running unit three in a controlled and reduced capacity, to help provide some relief with the extreme weather and demand placed on the system. Our ability to safely operate this unit was essential yesterday and helped ensure Victorians remained with power,” a spokesperson said. More than 250 homes were still without power in Adelaide’s western suburbs late this morning after transmission infrastructure buckled amid yesterday’s record heat. The problem peaked around 9.30pm Thursday when the lights went out in about 25,000 homes after transformers failed and fuses blew in temperatures that remained close to 40C. At 11.30am today, 265 homes in the Morphettville area, 10km southwest of the CBD, still did not have power. The problem was rectified just before midday. The temperature yesterday peaked at 46.6C — Adelaide’s hottest day since records began 130 years ago and the highest temperature ever recorded in an Australian capital city, passing Melbourne’s 46.4C on Black Saturday, February 7, 2009. Privately-owned SA Power Networks, the sole distributor of power across South Australia, apologised for the outages, but spokesman Paul Roberts said the problem could have been far worse. “The fuses on the transformer did their job and they failed first to prevent a catastrophic failure of transformers,” he told ABC radio. South Australian Energy Minister Dan van Holst Pellekaan said he understood the frustration of the consumers, but stressed the outages were not caused by “load shedding”. He said SA’s heaviest industrial energy users — Whyalla steelworks owner GFG Alliance, Port Pirie lead smelter operator Nyrstar, and mining giant BHP — all reduced consumption to free up supply. For the first time, South Australia’s emergency diesel generators — procured by the former Weatherill government in response to a statewide blackout in September 2016 — were switched on to help shore up supply in both South Australia and Victoria. 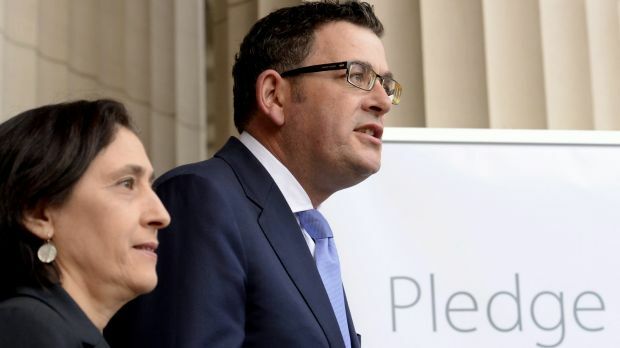 This morning, Energy Minister Lily D’Ambrosio said power brownouts had not been ruled out but “blackouts are something that absolutely will not be a feature of today or a possibility” as she urged Victorians to ration their non-essential electricity use. Dan and Lily: delivering the Dark Ages to Victorians. The menace of CO₂ emissions is wildly underestimated by any person sufficiently under-informed to imagine that solar “renewable” energy can combat it. I have made rough estimates of the amount of storage that would be necessary, but so can any person with access to history of any area’s existing wind turbine power delivery patterns. The areas of the troughs in these graphs are energy, in megawatt_days, far larger that any imaginable pumped hydro storage, and even the existing pumped hydro storage facilities vastly exceed the pathetic size of Elon Musk’s batteries. But Thorcon Power, a US company planning to build in Indonesia, quite convincingly describes how they expect to be able to build shippable 250 MW nuclear reactors, fed with uranium AND thorium, for both construction and operation costs lower than coal burners. It’s an MSR, Molten Salt Reactor, and is therefore immune to the meltdown of ceramic oxide fueled, water cooled reactors that need pressures of up to 150 atmospheres. The fuel itself is a very hot liquid at near ambient pressure, and it has a drain plug of the salt that is kept Not Molten by a fan driven by the same power as the circulation pumps, If that power fails, OR for any other reason the fuel-salt gets too hot, that plug is a fuse that dumps the fuel into a basin that kills the reaction. The only way renewables could work (at a huge cost) is with lots of storage, so our politicians have rushed headlong into renewables 6 years before any adequate storage is available (Snowy 2). Wasn’t there a reference in the Bible about animals rushing over a cliff? No fun being the crash test dummies of over-reliance on intermittent ruinables. Ms D’Ambrosio a delusional unknowledgeable fool who blames the thermal generators but not a word about the failed renewable generation, what a clown. Victoria definitely needs more windmills and on today’s numbers about 25 times the number of windmills.they presently have.. This I am sure will be the finding of the Alice in wonderland Victorian Government, you can never have too much stupidity in Australia now, the more the better. Renewable energy tends to do poorly in extreme weather events, such as snowstorms, hurricanes and heatwaves. It is suggested we have no more extreme weather events in the future. Let’s give them zealots another shot of adenlin in the rear end. Melbourne 37C and Sydney 30C, with just a zephyr of a breeze. Let’s send the Lovely Audrey and Lily into orbit by turning on every bloody appliance in the house. Personally my air conditioner will be set that low I’ll be sporting my “long Johns” and my north face puffer jacket. Pre-blackout: “There’ll be no blackouts. We have plenty of supply, but we encourage you to delay your clothes washing and dishwashers for a while.” If there was no problem with supply, why the warning? If that’s what “we’re” working towards, I’m really looking forward to the mess in another 10 years. D’Ambrosio said much the same things, but Victorians are stuck with her until the next election. Zibelman should be sent packing and replaced with someone who knows what they’re doing. But…the bottom line…Australians are still in love with renewable energy. They have been forcefed “green” ideology and have no concept of alternative views or options. To most, there is only one bright future and it’s “green” all the way. They might be a little confused by the blackouts, but their political leaders have been quick to blame extreme weather and coal, which should calm any doubts they have for the moment. A few more businesses closing and moving offshore will be a small price for many and little regard for most. “C’mon Aussie, c’mon!” Don’t let a little blackout deter you. Throttle down for more wind and solar. The world needs an example of how far this madness can go.